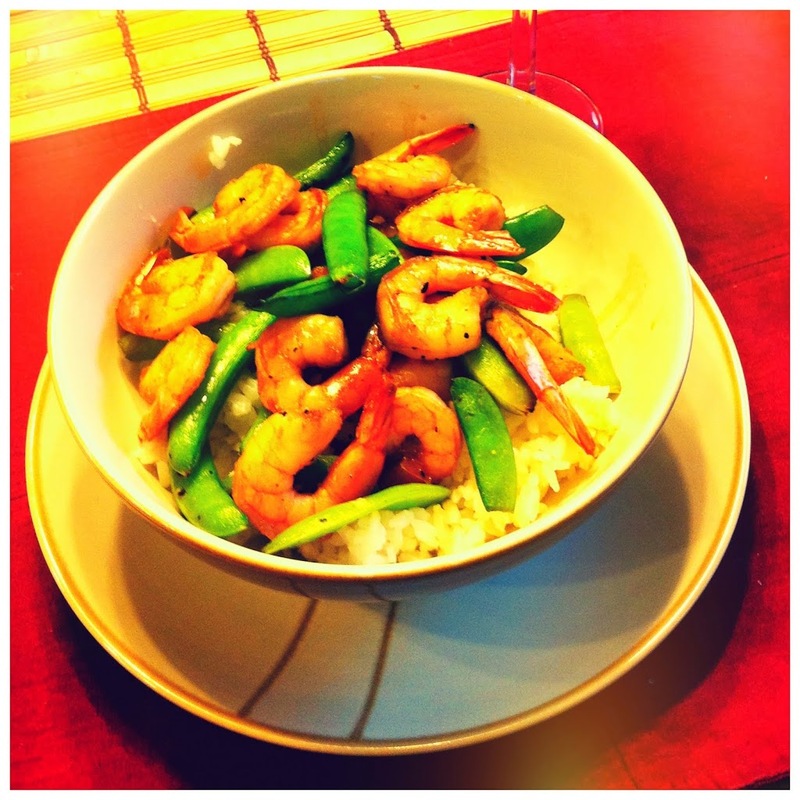 Snap peas and shrimp. The unknown and the more unknown. Okay. So. This started about a month ago. Chels and I were in Williams Sonoma, looking to spend some more of a gift card that a very generous friend gave us. We ended up getting quite a number of amazing kitchen items, but one in particular that greatly affects the outcome of this blog post. We decided to get a mesh grill pan. The truth? We honestly bought it less because of the possibilities than simply because the recipe on the front looked so insanely tasty. Those folks at Williams Sonoma know their marketing, I’m telling you. Actually, speaking of, they cook in the middle of the store! I didn’t know this until the first time we went a couple of years ago. This is brilliant on so many levels. Think about it! Not only is the amazing line up of products and seasonings being demonstrated in real time by real people, but the SMELL… It sticks around. You walk into the store and…the SMELL! You instantly just want to purchase everything in the store in hopes that if you take it back to your house it will magically recreate the incredible olfactory sensations you are experiencing. Surely, if you just buy the espresso machine and the European spatula and three different exotic barbecue sauces and the bamboo cutting board and the ceramic pie dish and you bring them all home and set them on the counter, the SMELL will come home with you. This is marketing at its finest. No deception. Just straight up olfactory seduction. Genius. Anyhow. So, we bought the mesh grill pan. Actually, now that we have it home, I can see a lot of possibilities for it. I’m tempted to try the veggies for my fajitas in it. The smoky flavor is fantastic, and I think it’s especially kind to greenery and roughage. But, first, Chels and I both felt we should try out the recipe that so visually enticed us in the store. Grilled shrimp and snap peas. Here’s the catch. Neither of us have ever cooked with shrimp. 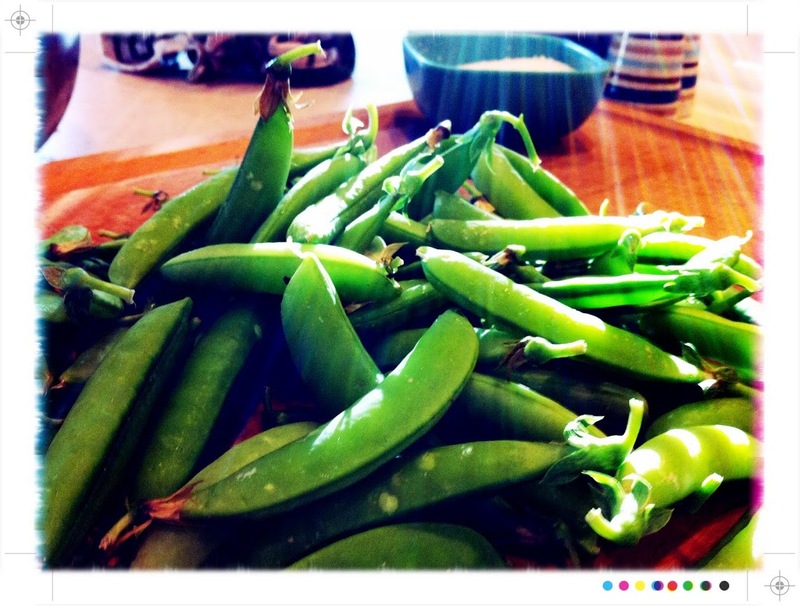 Or snap peas. Scary. 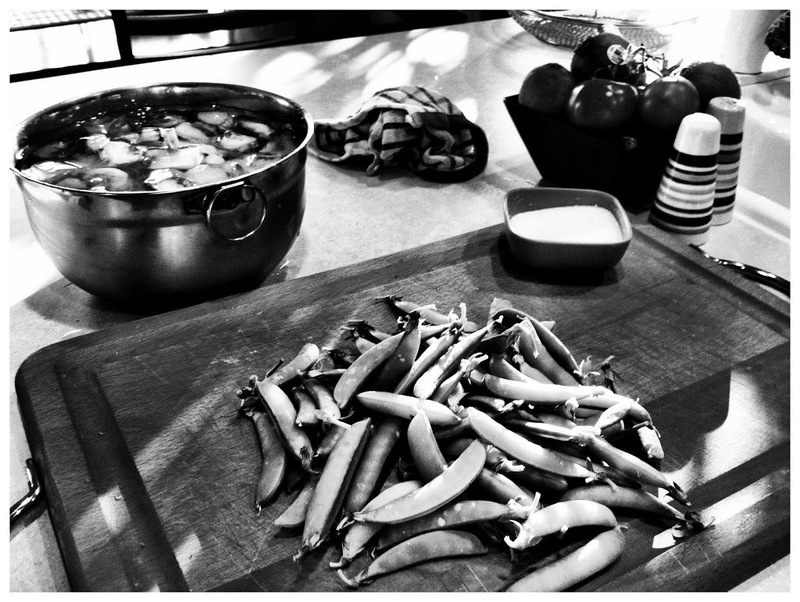 The snap peas were a little tough to track down. They really aren’t anything remotely resembling readily available in our local grocery stores. We actually procured ours from our local farmer’s market, which was rather wonderful. They were gorgeous, fresh, and photogenic. And not too much work to cut off he ends and pull off the hard “vein” running down one side. The light is a natural effect. No joke. The shrimp was much easier to get our hands on. The Pacific Northwest is generally an incredibly easy place to get one’s hands on fresh seafood. Now, the difficult thing for us here is that we wanted something friendly. 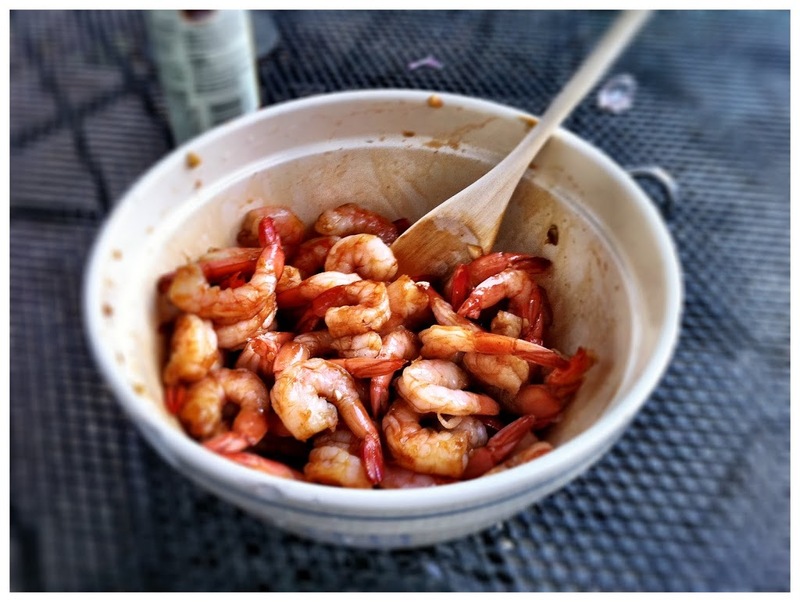 If you haven’t cooked with shrimp before, I think this is a great way to go. There are about ten or fifteen different kinds of shrimp in the seafood section (slight exaggeration? ), so choosing was challenging, but I’ll tell you why I think our decision was the right one for first-timers. The shrimp you are supposed to use for the recipe are jumbo and white. And not deveined. And other things. We wanted something smaller, manageable for the girls, and pre-prepared to certain extent (Pre-prepared? Like re-reopened or un-undone?). So, we chose the small pink cocktail shrimp. According to my research, for a lot of recipes, you can still cook with them the same way. They are already cleaned and deveined, which is awesome. I want to get more ambitious, but, hey, you can only mess with dinner so much – you still have to be able to eat it! One step at a time. Shrimp has to stay cold! For this recipe, the sauce is ridiculous. You just read the list of ingredients and go, “Yes. Yes. This is the way it is supposed to be. This is right. This is good. This is the answer to world hunger. World peace. 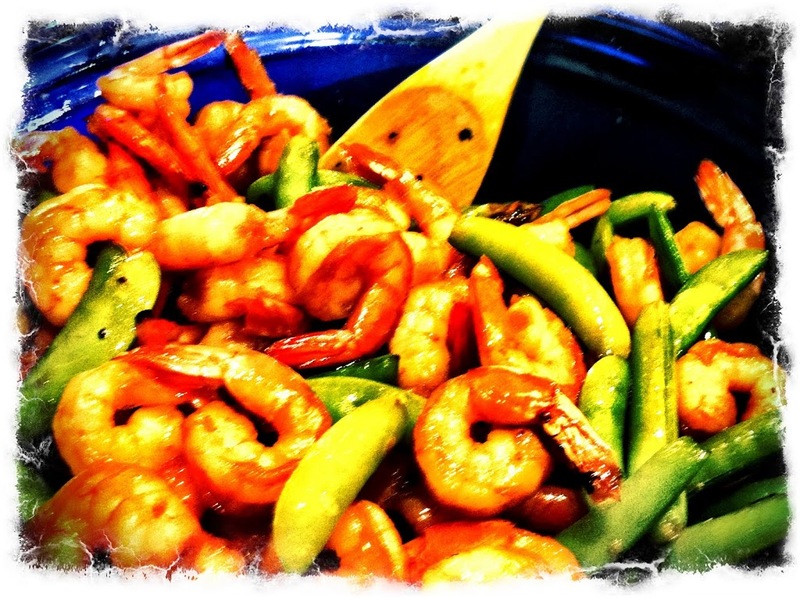 The cure for…shrimp that does not have sauce!” I mean, seriously – brown sugar (!!! 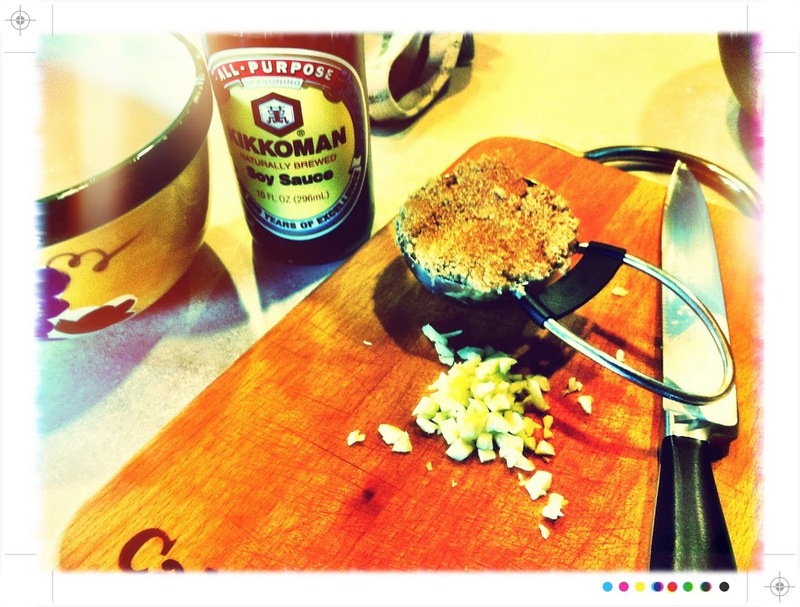 ), soy sauce, red pepper, ginger, and minced garlic! How insanely incredible does that combination sound? I can’t believe I didn’t think of it myself. I feel like you could put this on anything and it would instantly transport you to unknown and unexplored galaxies and latitudes (but not longitudes). Okay, ice cream is probably out of the question. And brownies. Maybe breakfast cereal. But I digress. As an aside, I definitely recommend following the recipe’s instructions and mincing fresh ginger and using actual pepper flakes. I didn’t have either of these things available to me, so I can vouch that, in a pinch, ground ginger and ground red pepper will work just fine. But, that being said, this is so easy. Mix the ingredients together. Done deal. Hmm. Too easy? Anyhow. Once the sauce is mixed up, simply set it aside and head out to the grill, where the real cooking happens. Honestly, this recipe almost makes itself. It is so simple! Once the mesh grill pan has finished heating in the grill (the handle on this one is removable, which is great for shutting the lid to heat it up), pour in the snap peas! They need to cook for about six minutes, during which time you’ll want to toss them, stir them, and just generally keep them from burning. A couple of mine got a little crispy on the edges, but that was actually fantastic. The flavor was smoky and wonderful. As the snap peas are doing their marvelous thing on the grill, it’s time to combine the sauce and the shrimp. 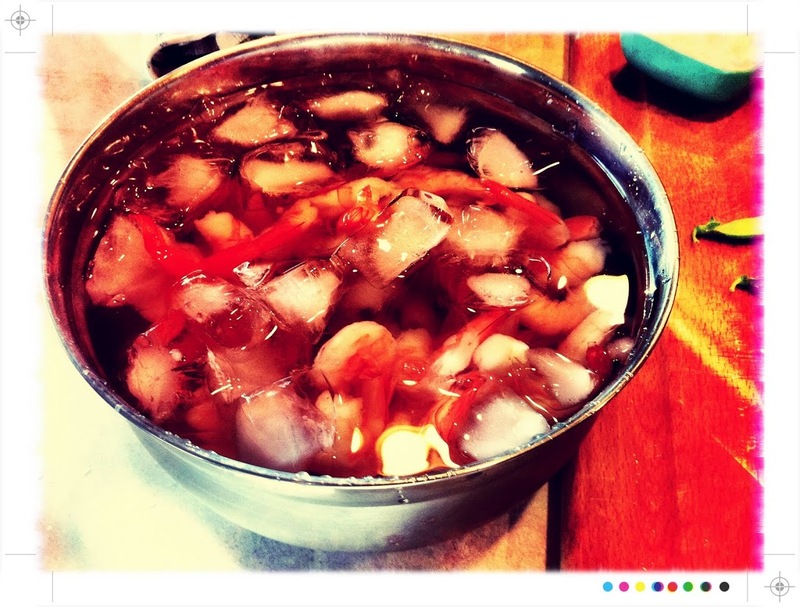 I used a colander to strain the shrimp out the ice water, and then put the shrimp into a medium-size bowl. You want to pour roughly half the sauce over the shrimp and mix it together. It does not have to be exact at all – don’t stress this point like I did! Eye half of it, and set the rest aside. 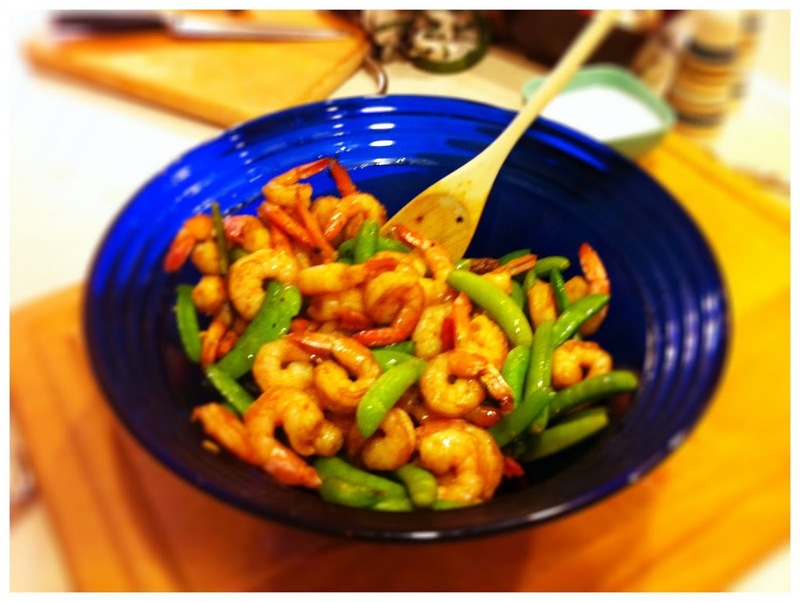 Once the snap peas have had their six minutes in the limelight, go ahead and add the shrimp. At this point, the SMELL… it is fantastic. Get a good wooden spoon out, and keep it moving. It sizzles and smokes and does all kinds of wonderful things. Another six minutes will about do the trick, and then you’re just about done. No joke. It’s that simple. Incredible color combination. See why we were seduced? Keeping it simple! At this point, you take the shrimp/snap pea mixture and pour it into a larger bowl (there are so many bowls in this recipe!). Take the rest of the sauce, and mix it in. That’s it. No joke. What color was missing? Blue! Evil knife lurking in background. I would definitely recommend serving and eating this one right off the grill. It is great hot – not so much cold. Sizzling is the key here. Sizzling. The serving suggestion is to simply spoon it out over rice, and I think that’s the way to be. I want to try brown rice next time, but this time we used white, and drizzled a little (a little!!) extra soy sauce over it. And that’s it! How easy is that? Nothing short of a gourmet Aisan-inpsired seafood dish. In 15 minutes. Almost impossible to mess up. Do it. Enjoy it. Even Eden (our two-year-old) loved it! 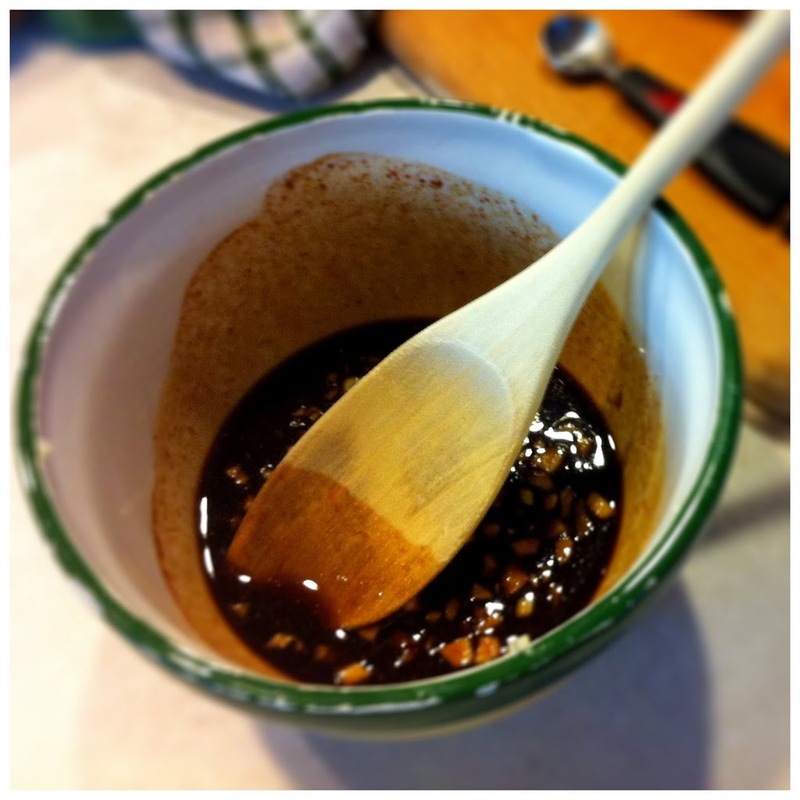 In a small bowl, stir together the ginger, soy sauce, garlic, brown sugar, and red pepper flakes. Set aside. Preheat grill over high heat. 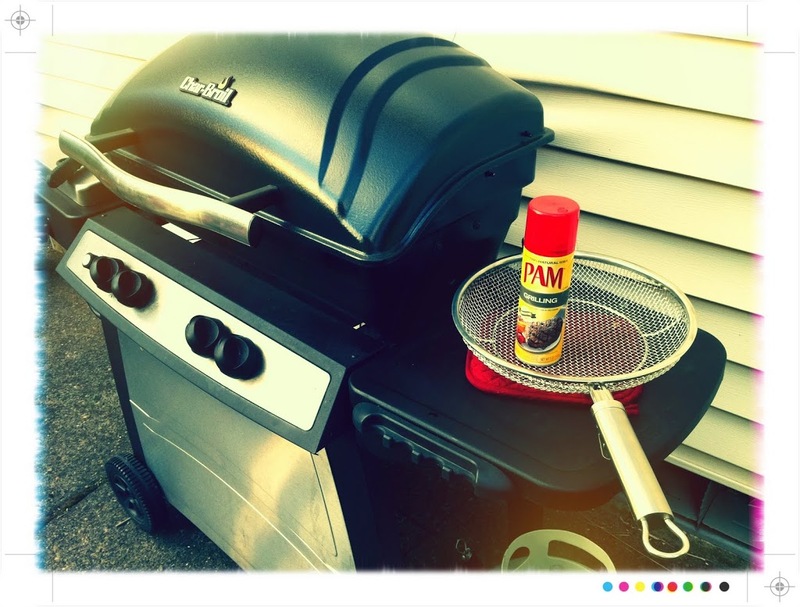 Spray mesh grill pan and place on the grill for 5 minutes before cooking. 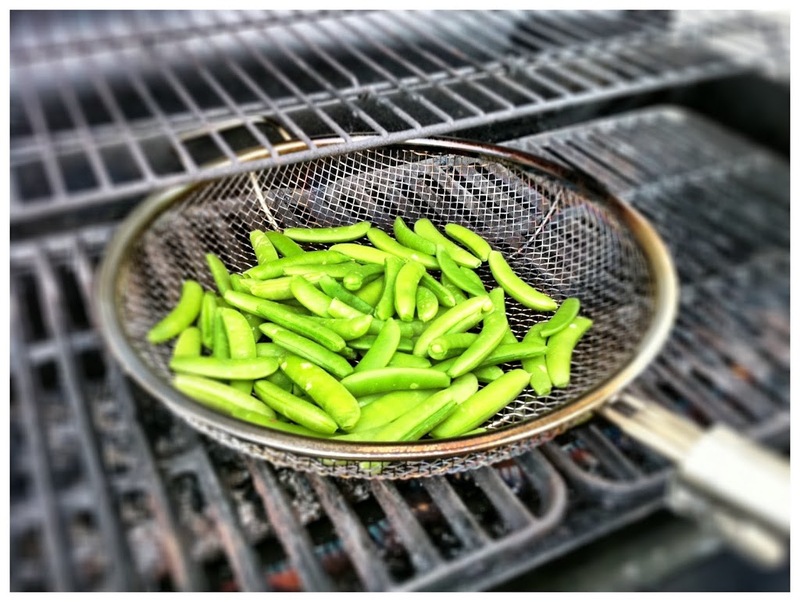 Place snap peas in grill pan. Cover and cook tossing occasionally for 6 minutes. 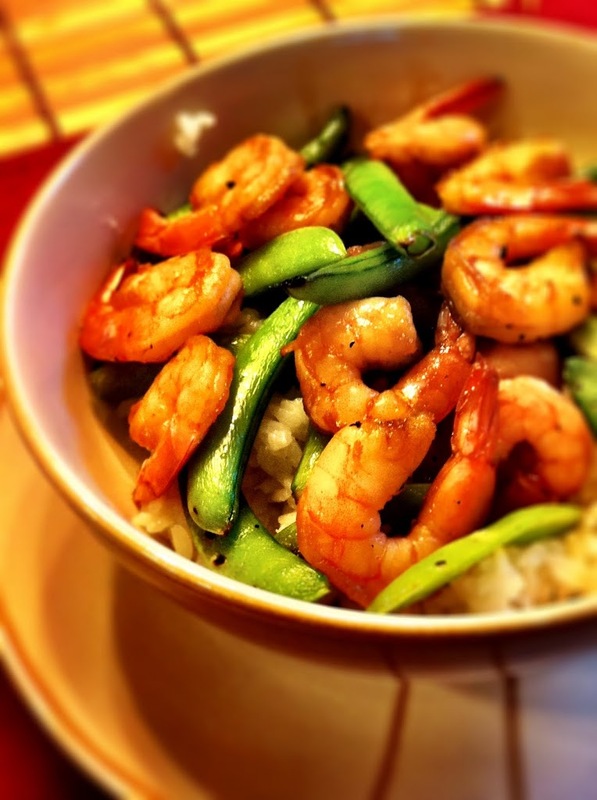 In a bowl, stir together shrimp and half of the ginger-soy sauce. 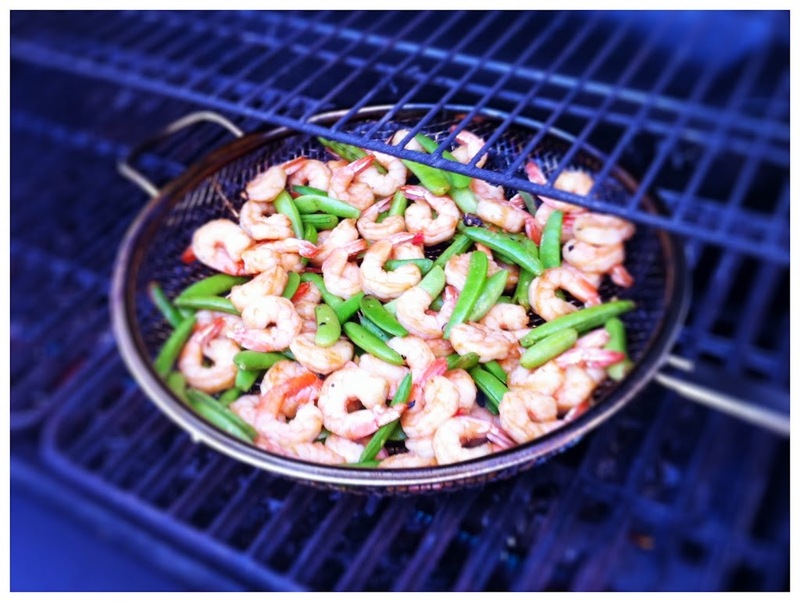 Stir shrimp into the grill pan with the snap peas (once they are tender). Cook stirring occasionally for about 6 minutes. 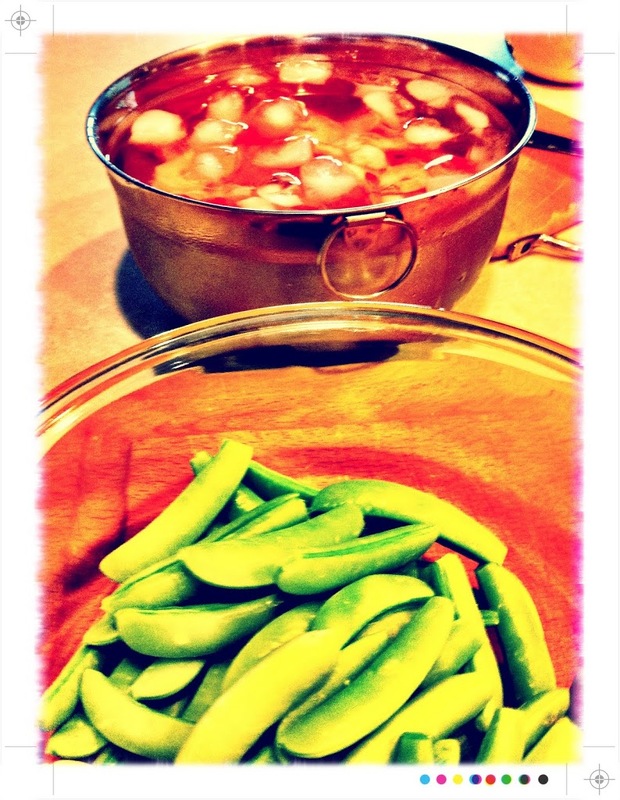 Transfer to a large bowl, add the remaining ginger-soy sauce. Stir and serve over steamed rice.